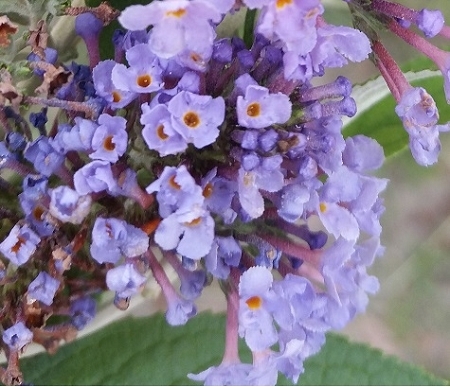 Ellen's Blue Butterfly Bush- (buddleia davidii 'Ellen's blue') Beautiful medium blue flowers will attract butterflies to the garden. Compact growing bush (up to 5' x 5'). Perennial zones 5-9. Live plant in 3 inch container. I've just received my order for this (Ellen's Blue) and one other (Adonis Blue) buddleia. I was pleased with the quality of these fully leaved and healthy plants, and look forward to their maturity, when I can see their true blossom color. I'm sure they will make a nice addition to my church's landscaping.